Hi, I’m Peter, and I’d like to share my experience with you because I know it will inspire you as much as it did me. You see, when we work together, we can help Indigenous people in amazing ways. Milikapiti is a village on the northern coast of Melville Island, in the Tiwi Island group of the Northern Territory. It’s 105 kilometres by air from Darwin and has a population of around 450. Local Milikapiti women and children had come up with the clever idea of creating a community garden at Milikapiti Family Centre Community Safe House, an important place of refuge and source of support. The community drew up a plan but needed help to turn it into something real. That’s where ICV came in. 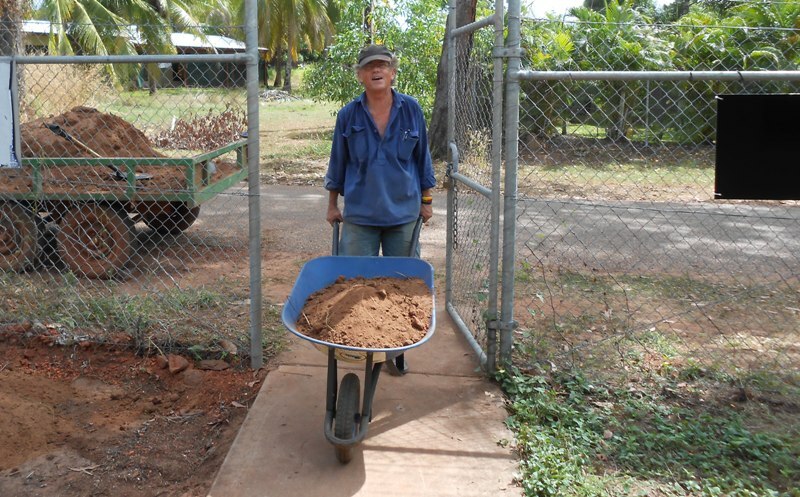 Indigenous communities trust ICV to help them achieve their goals because they know ICV works on the principles of collaboration and community ownership. When communities are in control of their own development goals, they have a much better chance of succeeding. ICV was asked to help find a horticulturist to mentor a local team and engage the whole community in developing the safe house grounds. I was delighted when I was asked to be involved. I’m a keen gardener from the Snowy Mountains of NSW, and I used to teach horticulture for TAFE. I’ve volunteered with ICV before at Barunga (NT) and on Mornington Island (QLD) and loved every minute of it, so of course I said yes! Many hands have made for light work in Milikapiti. Men, women and children have all helped create the fruit and vegetable gardens that are now thriving in the community. From design through construction, planting and maintenance, community members have contributed to a marvellous makeover that has added a shade shelter and fire pit and created a friendly meeting place. When I arrived in mid-May one garden bed was just about ready to plant. I arrived on a Wednesday, and we planted the first corn and rockmelon seeds the next day. By the following Monday, seedlings had emerged, and the project was off to a flying start. Over the next few weeks, I worked with the local CDEP (Community Development Employment Projects) team and Indigenous Safe House staff. We planted beans among the corn and started tomato and chilli seedlings in trays. We revitalised the mulberry tree growing next door at the women’s centre, and we planted several cuttings that struck within days. The project inspired some generous donations from other organisations and community groups too. The local farm donated some excellent mulch to protect the young plants, and some fertiliser and gypsum to improve the soil. Community women planted several gardens with seeds donated by The Mulch Pitt community garden on the mainland. The women are now tending pumpkins and zucchinis, salad greens and another bed of corn, peppers and spring onions. Mark, a teacher’s assistant from the local school, was most helpful and brought a team of enthusiastic young gardeners over to plant another garden which takes pride of place at the front of the safe house. The children planted a variety of fruit and vegetables and practised watering the seedlings gently. They were very keen to come back to tend their plants! We recorded everything we did each day and made notes that the gardeners can refer to when planting next year’s garden. We took lots of photos and I have wonderful memories of the fun and the camaraderie we shared. The Milikapiti community was so welcoming, they took me out fishing and taught me how to catch, gather and cook fish, mud crab and shellfish known locally as ‘longbum’. I also learned a lot about Tiwi Art and was given a book and a beautiful art piece as a gift. Most importantly, because the community garden project was their own idea and they were directly involved in it, the safe house now feels like it’s really theirs. And community members have the knowledge and skills to maintain the garden in the future years.